I am not entirely innocent when it comes to finding photographs and other items to add to the site, but you will never, ever, find any attempt by me to pass off someone else's work as my own. Other people work to different rules, and I know of many sites which have simply copied material from this one. However, the sleeve notes on this CD are the most blatant piece of cheek I have ever encountered. during the interval, and when the curtains opened, a frightened 18-year-old made his public debut as a singer. Parnes reasoned that no one called Ronald Wycherley would become a rock star, so he renamed him Billy - after band leader Billy Cotton - and Fury, to compensate for the singer's shyness....Billy's first recording, Maybe Tomorrow (one of those he offered to Marty Wilde) went into the Top 20. He made the Sound Of Fury 10-inch album, a rockabilly collection of self-penned numbers, which remains many fans' favourite recording. Every song was recorded during two, three hour sessions. Among the backing instrumentalists is Joe Brown, later to have a number 1 with Picture Of You, and still touring today...In the next year, Billy had four more hits, including Colette, an early attempt at double tracking. Billy loved rock and roll, and he could belt out the real rocking numbers. However, Parnes re-invented him as a balladeer, and in the eyes of the public, Billy became identified with big production numbers. 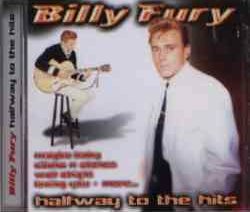 His cover version of Tony Orlando's Halfway To Paradise went to number 3 in 1961, and to many people in the UK, Billy Fury and Paradise are inextricably linked. From 1995-7, listeners to Britain's most popular oldies station, Gem-AM, voted Halfway To Paradise the runner-up in their annual favourite oldies chart. (The winner each year was Unchained Melody by the Righteous Brothers.) Paradise finally reached number 1 in the vote in 1998. Billy fought his shyness and became a real presence on stage, with his typical hunched-shoulder stance, and the British public took him to their hearts. Although the hits continued to come, Billy never had a number 1. He reached number 2 with Jealousy, and while When Will You Say I Love You was at number 3, the top spot was held by From Me To You, by a band that once failed an audition for the job of Billy's backing group. 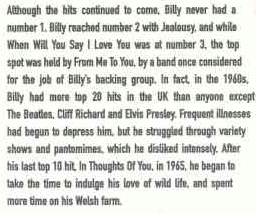 In fact, in the 1960s, Billy had more top 20 hits in the UK than anyone except The Beatles, Cliff Richard and Elvis Presley...Frequent illnesses had begun to depress him, but he struggled through variety shows and pantomimes, which he disliked intensely...After his last top 10 hit, In Thoughts Of You, in 1965, Billy began to take the time to indulge his love of wild life. In 1973, he resurfaced briefly in the film That'll Be The Day...A real comeback seemed on the cards in the early 1980s, when he was tempted into the studio again, to make an exceptional album, The One And Only Billy Fury...A live TV show and a national promotional tour followed, but at 2.10pm on 28th January, 1983...The heart weakness that had dogged him throughout his life finally claimed him. I faxed this page to Going For A Song on September 25, 2000. As I heard nothing from them, I telephoned on October 13. The person I needed to speak to was "not available" and I was promised a call back. I'm still waiting.